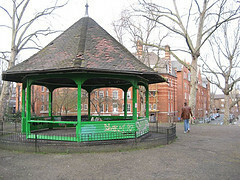 Arnold Circus hides Victorian secrets. Image taken on a ley-line walk with the performers by Alasdair Mackenzie. You could say that Robert Kingham and Rich Cochrane are crossing some kind of line by turning psychogeography into performance art. But, then, crossing lines is what psychogeographers do. Last Friday, the boys performed their two-act Align to a packed Bridewell Theatre. Align, or 'Iain Sinclair: The Musical' as we'd like to dub it, is an audio-visual essay on the hidden landscape of London and beyond. If you've read any Peter Ackroyd, dabbled in Sinclair, or pondered THAT chapter in From Hell, you'll know the territory. Align's mesmeric narrative unplugs hidden springs and rivers, excavates forgotten mounds and cairns, and traces ley lines through the heart of the city. You'll never look at Arnold Circus in the same way again. To convey such powerful ideas, lesser performers might have ratcheted up the gravitas and peppered the delivery with dramatic pauses and hammy crescendos. But Robert Kingham takes a lighter tone, dispensing his arcane insights like an exuberant lecturer or impassioned tour guide. The tension is embellished by the sometimes menacing, sometimes delicate musical accompaniment of Rich Cochrane. His soundtrack prompts its own psychomusicological musings: is this some lost 13th tribe, split from Godspeed You! Black Emperor? While the overall theme looks at ancient alignments, the narrative is anything but linear. We bounce around city and countryside, leap to Australia and back to Spitalfields, climb the ancient mound of Silbury and breath in the alignment of a 17th century vinegar factory, all the time gathering up locations in a katamari of connections. There may be nothing more to these tales than coincidence and happenstance, but it's an exhilarating ride nonetheless. To their credit, the performers never out themselves as 'true believers', but concern themselves more with how theories of ley lines and such have influenced others. Further performances of Align are planned but no dates have yet been announced. When they are, make sure that you're first in line.